“I pick that axe and then I get a call; some bad guy is gonna take a fall!” My God, those old cartoon intros were just the best. They literally do not make them like that anymore. In addition to being the lead vocalist and guitarist of a very popular music act (Butch gets mobbed by his fans quite a lot), Cassidy is also a superspy, taking his orders from the super-computer, Mr. Socrates. Other cast members include Cassidy’s band, the Sundance Kids: Merilee, the sexpot blonde tambourine player, who’s sweet on Butch; Stephanie, the intelligent brunette bass player (the blonde is always the pretty one and the brunette is always the smart one in these cartoons); and Wally, the awkward and somewhat dull-witted drummer. Finally, there’s Elvis the dog, to whom Mr. Socrates is somehow allergic, causing him to sneeze even though he’s a computer and does not actually have a respiratory system. Like many Hanna-Barbera toons of the era, this one was a hodgepodge of ideas. 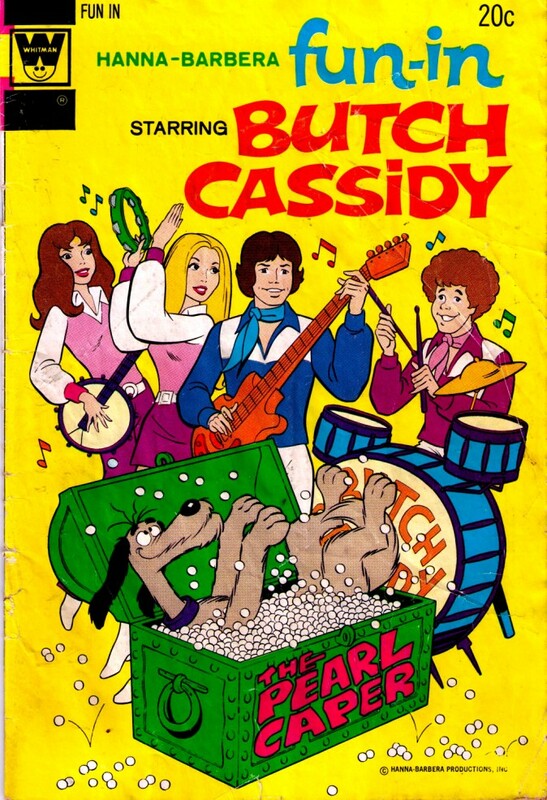 First, while the character’s name may evoke a famous figure of the Old West, Butch was clearly inspired by a different Cassidy—David Cassidy (aka Keith Partridge). Not only does he look like him, he sounds like him when he sings, too. So we got bubblegum pop sung by a teen heartthrob, with every episode having a musical interlude. Then there’s the premise of a group of kids solving mysteries, a formula that was returned to again and again in the wake of the success of Scooby-Doo. 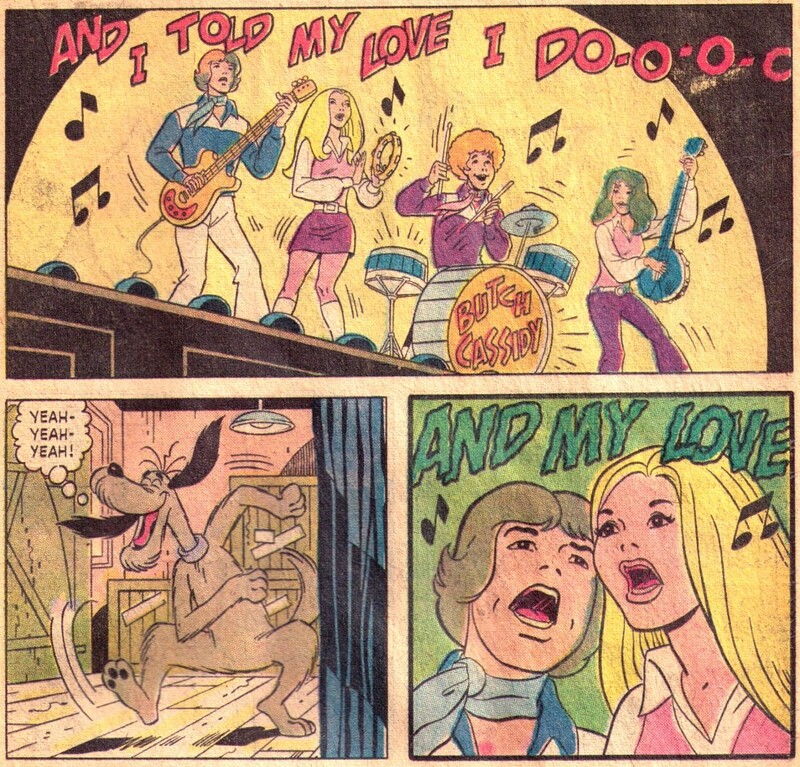 Then you’ve got the dog providing comedy relief, also lifted straight from Scooby-Doo. (Damn near every cartoon back then featured a snickering dog. It was practically a requirement. Not that I’m complaining—I love dogs.) Finally, there’s the spy stuff, which seems to borrow a lot from James Bond and similar spy movies/TV shows. As for said comic, Hanna-Barbera Fun-In was published by Gold Key beginning in 1970, but for some arcane reason, the last six issues of the series (nearly all of which came out in the back half of ‘74) were also published concurrently by Whitman. This issue, #11, was the only one to feature Butch and the gang. No credits for the artwork in the issue, but the story was adapted from the fifth episode of the cartoon series. Fun fact: Gold Key/Whitman lagged behind Marvel and DC when it came to price increases, hence the cover price on this issue of twenty cents. (Two issues later, the series made the jump to a quarter.) So this issue is the cheapest comic I ever purchased off the stands. I felt younger thinking that a full quarter was the cheapest I ever paid; I’m kinda depressed by this realization that I once paid twenty cents now. Also: While I believe I purchased this one down the shore along with the rest of my 1974 haul, it’s possible I could be mistaken about this. Like all Hanna-Barbera cartoons of the 60s and 70s, Butch & the Kids also got some coverage on Adult Swim in later decades. See Wikipedia for the details. Finally, the Warner Archive put up a brief episode preview on Youtube. Like almost every other classic H-B cartoon, you can purchase the series on DVD on demand straight from Warner Brothers or via Amazon. Previous PostTwerps, Bozos, and Homicidal Elves, Oh My!Next PostThe All-Time JLA-JSA Team-Up Countdown!